Are all mugs created equal? The answer is, definitely not! After all, you can never quite tell just which particular mug would make your morning coffee taste as though it is the best brew ever you have drank in your life. It is a really personal item, and apart from the usual mugs that have self inflating words such as “World’s Best Dad” or “#1 Mom” printed across, how about settling for this zany looking $9.99 Happy Camper Mug? It will certainly help carve a smile on your face for sure, as it gives your morning a lovely kick start. 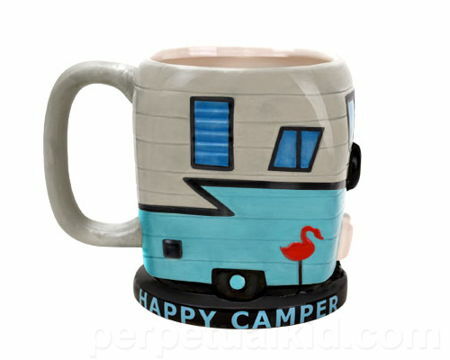 The Happy Camper Mug looks like a turquoise and grey retro RV camper, and is capable of holding 16 oz. of your favorite beverage.